Who goes into the night, so they can save the day? Who are these heroes to show you the way? PJ Masks, we're the PJ Masks! If hearing these lyrics gets your kiddo super jazzed, then you may just have a little crime-fighter on your hands! By day, the PJ Masks are Amaya, Greg, and Connor but by night, they are the super-trio Owlette, Gecko, and Catboy! If your kid is a bit of a natural leader and prowls your neighborhood looking for trouble to stomp out, then they may just take a liking to having a PJ Masks Classic Catboy Costume of their very own! Your kid can outrun their brothers and sisters, be the first to the car yelling "shotgun," and win every obstacle course at school while wearing this suit. In fact, your kid bears such a resemblance to the speedy feline Catboy that...wait...your kid's name isn't Connor, is it? 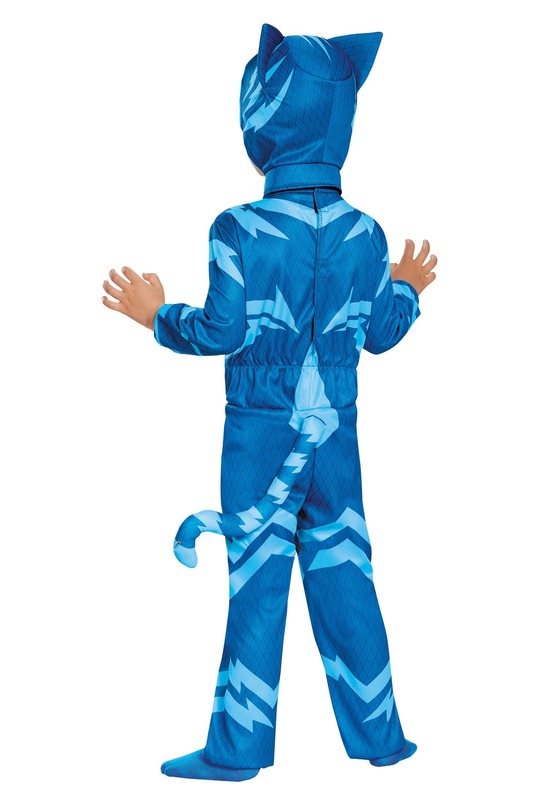 This licensed look comes with a blue printed jumpsuit that replicates Catboy's on the show! A stuffed tail attaches to the back for easy transformation when trouble ensues! The hood and mask conceal your kiddo's true identity, so they can remain protected from evil villains like Armadillain, Night Ninja, and Luna girl. Of course, sometimes they may just want to stay hidden from their siblings. 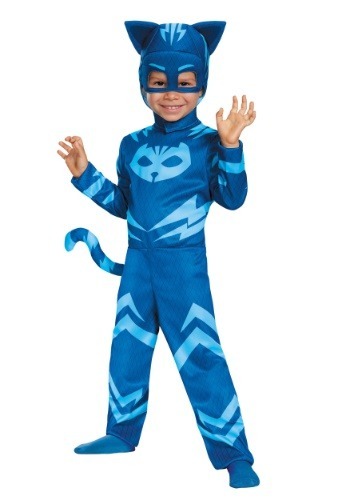 Either way, your child will feel speedy and agile and able to fight crime after bedtime in this great look! Just make sure that, as Catboy, your child doesn't get too bossy or forget to work together with his group. It's really hard to stop evil villains alone! Maybe there's an Owlette and Gecko secretly hiding in the neighborhood and they can all team up for a cute group costume. After scoring big trick-or-treating, they can try to solve a persistent Halloween crime: "fun" sized candy.